Larnaka seafront is vaguely reminiscent of the Continental promeande, with its line of mature palms and its languid air of sleepy charm. Cafes and tavernas line the area near the sea, making this a popular spot with visitors and Cypriots alike during the long summer. 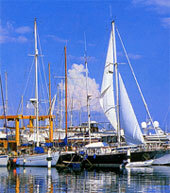 Nearby is the Marina, frequented by yachtsmen from all over the world. All the western end of the promenade is the town's 17th century fort, which now houses the Larnaka mediaeval Museum. 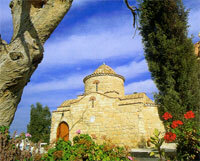 As the home of the island's main international airport, Larnaka offers many visitors their first taste of Cyprus. One of the first sights is the beautiful Salt Lake, home in the cooler months to colonies of graceful flamingos and other migratory birds. Beside the Lake, in a tranquil setting crowned by lush palms, is the Hala Sultan Tekesi, built to the memory of Prophet Mohammed's aunt. Larnaka's links with Christianity go back to the very beginning, for the town's first bishop was none other than Agios Lazaros, who chose to live his 'second life' there after Jesus had raised him from the dead. A church built in his anme exists on the spot where his remains were said to be found. Larnaka's District Archaelogiacal Museum and the Pierides Foundation Museum exhibit particularly interesting antiquities. The town's marble bust of Zenon, after the philosopher who founded the famous Stoic School, bears testimony to another famous son. Also of interest is the ancient city- kingdom of kition established by Mycenean Greeks in the 13th century B.C., the Church of Agia Faneromeni, built over a rock cave dating from the 8th century B.C. and the 18th century aqueduct on the outskirts of town. Stavrovouni, one of the oldest and most dramatically sited monasteries in Cyprus, founded by Saint Helena, is within reach of Larnaka. Pearched atop a mountain it has stunning views in all directions. In accordance with the strict monastic tradition observed with this particular order, women are not allowed inside Stavrovouni Monastery. Again within striking distance of Larnaka, is the Church of Panagia Angeloktisti which houses the 6th century lifesize Byzantine mosaic of the Virgin Mary- one of the finest in the world from this period. A visit to the village of Lefkara, famed for the lace-like embroidery known as 'Lefkaritika' that was said to captivate Leonardo da Vinci, is also a treat. Further south, is the remarkable site of Choirokoitia, included in the Unesco World Heritage List, where excavations have yielded one of the most important Neolithic settlements found anywhere in the world.